BICC brief 35 presents the findings of the BICC Project “Analysis of the implementation of DD&R (Disarmament, Demobilization and Reintegration) in Aceh Province, Indonesia”, deriving from interviews conducted with a variety of actors in Aceh in November 2006, and the analysis of secondary literature and program information. 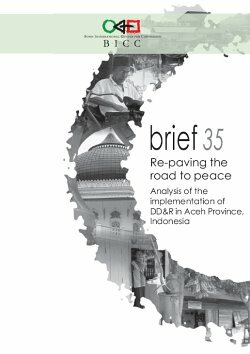 While the main focus of this publication lies on the DD&R process, developments that have taken place in Aceh since the signing of the Memorandum of Understanding (MoU) in August 2005 between the Government of Indonesia (GoI) and the Free Aceh Movement/Gerakan Aceh Merdeka (GAM) have also been taken into consideration, as these influenced DD&R process. This brief’s objective is to provide a comprehensive overview of the DD&R process and to assess how the peace process has progressed since the signing of the MoU that ended nearly 30 years of armed conflict.